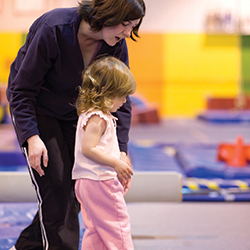 Fortunately, Salem Gymnastics knows how to lay the foundation that gives each child the confidence to succeed not only on the playground, but wherever their passions lead them! Your Child Can Benefit from Salem’s Instruction in ALL of Our Programs! Quality instruction with parent supervision Our Parent/Tot classes give toddlers a head start in fitness and social development. Through the help of our staff, you can teach your child to explore the world around him in new and exciting ways. Children are developing rapidly during these first years, and early development stimulates learning skills. Your child may roll down a padded incline, swing on tiny bars, possibly stop for a game of hoops then it’s off to the trampoline or the ever popular “pit”! Help your child boldly go where no toddler has gone before! No charge for siblings under the age of 1. Learning through FUN is the goal of our Tumbleweeds! Our professionally structured program is designed to develop motor and social skills, but our Tumbleweeds would never know it! 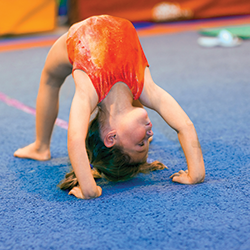 In addition to gymnastics, students are exposed to basic skills in soccer, tennis, football, golf and more. By exposing your child to a variety of skills, we are laying the base for a positive athletic future, no matter what the sport. Tumbleweeds also learn social skills such as sharing, taking turns and cooperation, which are quite valuable for someone looking ahead to Kindergarten! You may enroll your child in Tumbleweeds once they reach their 3rd birthday and are potty trained.